To celebrate their 50th Anniversary Colleen and Michael had a party with close family and friends. The venue was Roblar Winery in the Santa Ynez Valley. The event’s color scheme was coral and Tiffany and Co. blue, which you'll see in the printed materials and décor. The invitation suite, done by Oak and Orchid, featured grapes and vines to reflect the winery venue. The day was filled with special touches, such as rock candy sticks in the vintage crystal glassware and pashminas for the female guests tied to the backs of the chairs, to keep warm as the sun set. Another little detail were roses placed in the fountain, customizing the venue even more. The tables had centerpieces designed by Precious and Blooming. The floral arrangements had a collection of coral peonies, garden roses and peach flowers. The linens from La Tavola Linens were a ocean teal, bringing in some deeper tones. Chandeliers hung from the pergola of the outdoor venue, bringing a gorgeous glow as the sun set. For the entertainment Ybarra Music performed hits from Rod Stewart and Tina Turner and Open Air Photobooth took photos of the guests with fun wine-themed props. Everyone got up to dance, twirling around the dance floor for most of the night. Roblar Winery provided a selection of their wines, guests enjoyed getting to try a wide variety. Guests had halibut tartar, garlic lemon grilled shrimp, and artichoke fontina crostini appetizers. After a plated salad the main course was served. Guest were given brown sugar chipotle rubbed seared salmon, daube de boeuf Provençale and grilled asparagus and blistered cherry tomato penne pasta. 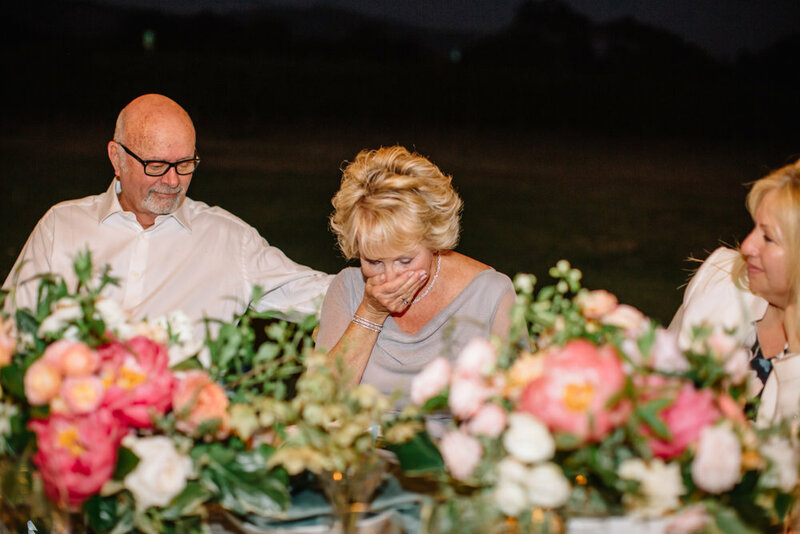 The most exciting part of the night was a surprise Michael had planned for Colleen. When dessert was served individual cakes by Decadence Fine Cakes and Confections were brought to each place setting. The cakes were made to look like the little blue boxes from Tiffany and Co. and featured champagne flavored cake with strawberry preserves and drunken berry affogato. Except instead of a cake Colleen was given a real blue box! She opened it up to find a Tiffany and Co. Soleste ring- a stunning 50th Anniversary present from her husband. Colleen had no idea and was so delighted about her stunning new sparkler. The couple danced and shared kisses for the rest of the night, so blissful about the 50 years they have spent together. Cheers to many more!